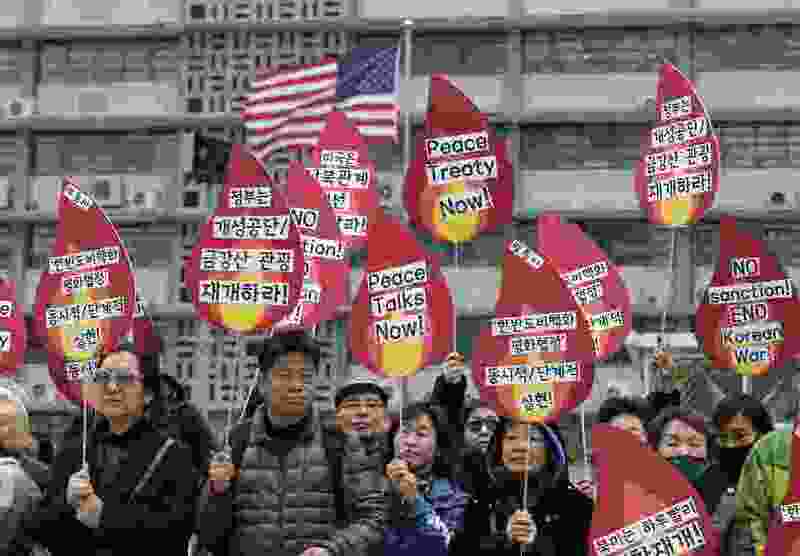 (AP Photo/Lee Jin-man) Protesters hold signs during a rally demanding the denuclearization of the Korean Peninsula and peace treaty near the U.S. embassy in Seoul, South Korea, Thursday, March 21, 2019. The Korean Peninsula remains in a technical state of war because the 1950-53 Korean War ended with an armistice, not a peace treaty. More than 20 protesters participated at a rally and also demanding the end the Korean War and to stop the sanction on North Korea. The letters read "Restarting operations at Kaesong industrial complex and Diamond Mountain resort." Palm Beach, Fla. • President Donald Trump tweeted Friday that he has reversed his administration’s decision to slap new sanctions on North Korea, with his press secretary explaining that he “likes” leader Kim Jong Un and doesn’t think they’re necessary.